This entry was posted in on November 17, 2017 . It’s the musical event of the year! Antigonish Performing Arts presents the Tafelmusik Baroque Orchestra with J.S. Bach: The Circle of Creation Friday, November 24th at 8 p.m. in Immaculata Auditorium. J.S. Bach: The Circle of Creation combines text, music, and stunning projected video and images to explore the world of the artisans who helped J.S. Bach realize his musical genius. 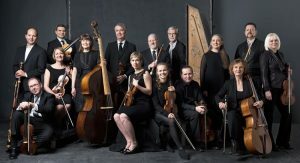 Tafelmusik Baroque Orchestra’s J.S. Bach: The Circle of Creation, Friday, November 24th at 8 p.m. in Immaculata Auditorium. Presented by Antigonish Performing Arts and proudly supported by 989 Nothing But Hits!